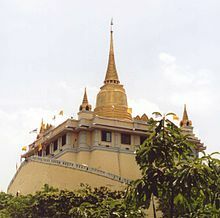 Wat Saket is an undistinguished temple except for the Golden Mountain or Phu Khao Thong, on the west side of the grounds. The steep climb tip to the Golden Mountain puts everything back in perspective and offers views over Rattanakosin Island that are simply stunning. The artificial hill was created when a large Chedi under construction by King Rama III collapsed because the soft soil beneath would not support it. The resulting mud-and-brick hill was left to sprout weeds until King Rama IV built a small Chedi on its crest. 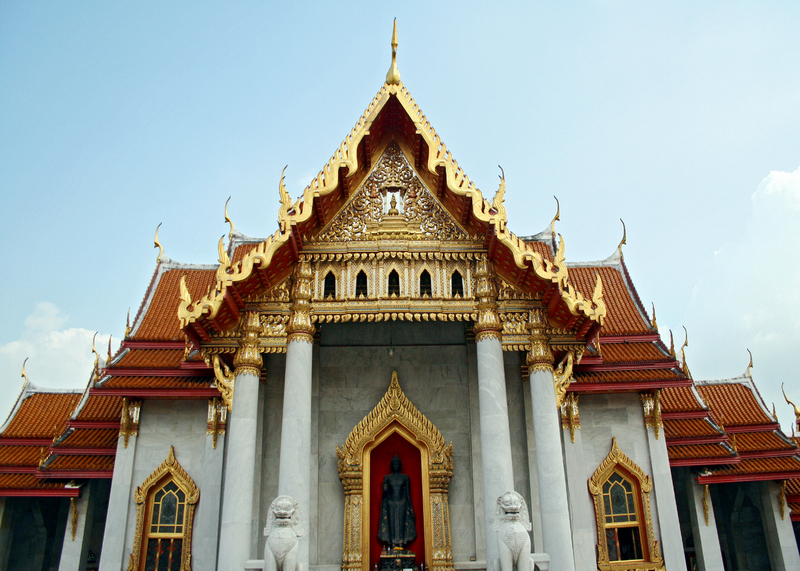 King Rama V later added to the structure and housed a Buddha relic from India in the Chedi. The concrete walls were added during World War II to prevent the hill from eroding. Thai craftsmanship, say, second to none in the world. It attracts the interest of tourists throughout the world to come to visit in large numbers each year. 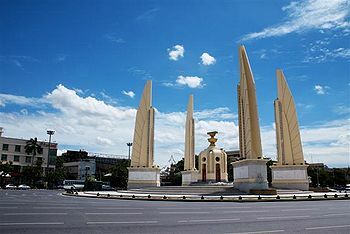 The connected to Rattanakosin via the boulevards of Rajdamnoen Klang and Rajdamnoen Nok, the spacious, leafy area known as Dusit had been the royal district since the reign of Rama V (1860-1910). The first Thai monarch to visit Europe, King Rama V returned with redical plans for the modernization of his capital, the fruits of which are most visible in Dusit: notably Vimanmek palace and Anandasamakom throne hall. Today the peaceful Dusit area retains its European feel, and much of the country's decision-making goes on behind the high fences and impressive facades that line its leafy avenues. The Democracy of Monument is located in the centre of the circle on Central Ratchadamnoen Avenue. This monument was built during the Phibulsonggram regime to commemorate the activity of the People's Group which requested the Constitution from the King (King Rama VII) on 24th June, A.D. 1932. Construction was started in July A.D. 1939 and was completed on 22nd June, A.D. 1940. The inauguration ceremony took place on 24th June, A.D. 1940. 50 metres high. Around the base of the bayonets are statues representing the army, navy, air-force, police and civilian services. Under the statues are bronze plates engraved with the names of people who died during the Franco-Thai dispute in 1943. When a foreign dignitary pays a state visit to Thailand, laying a wreath at the monument is one of the ceremomies included in his schedule. 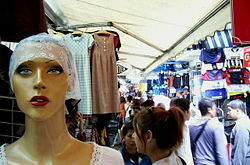 The monument area is also a major centre for busesgoing to all parts of Bangkok. Within walking distance of the Grand Palace, this complex was once a palace consisting of several old beautiful Thai style buildings. 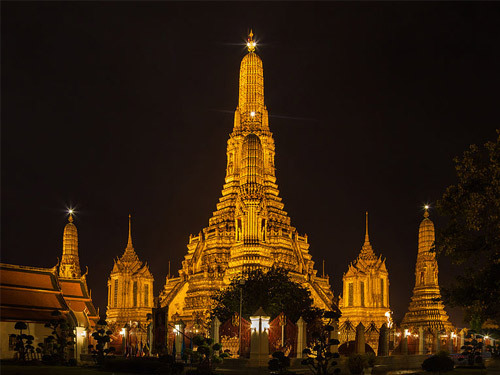 It houses a vast collection of artifacts found in all parts of the country ranging from neolithic times, Sukhothai, Ayutthaya to the Bangkok period. The museum is open from Wednesdays to Sundays, 9.00 a.m. - 4.00 p.m. and closed on Mondays, Tuesdays, and public holidays. Admission fee is 40 baht. Guided tours in English, French, German and Japanese are provided to visitors on certain days of week. Vimanmek, a beautiful three-story mansion, is considered the largest golden teak building in the world, with some 80-odd rooms. Built in 1900, by King Chulalongkorn (Rama V), it remained a royal residence after his death, but was used only for storage after 1932. In 1982, Queen Sirikit led the effort to reopen the palace as a museum and repository for the effects of Rama V. Today, this exceptional example of royal residential architecture, still used by Queen Sirikit for occasional royal functions, is open to the public. Daily tours occur in Thai and English each half-hour, from 8:30 am – 3:30 pm. If you purchased a ticket to the Royal Palace, you may use it the same day to visit Vimanmek. If not, tickets are 100 baht. If you are into computers then Pantip Plaza is the place, a Mecca for all of Bangkok's computer users. 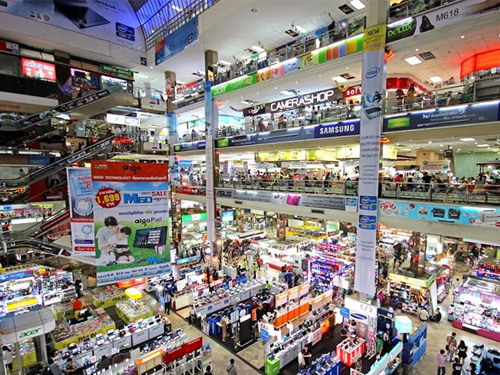 Here you will find 5+ floors of the most keenly priced hardware and software in Asia. Plenty of software and hardware for PC, Mac and peripherals of all types. This is also a good place to bring any damaged equipment for repair, they are particularly skilful with notebook PCs and printers. 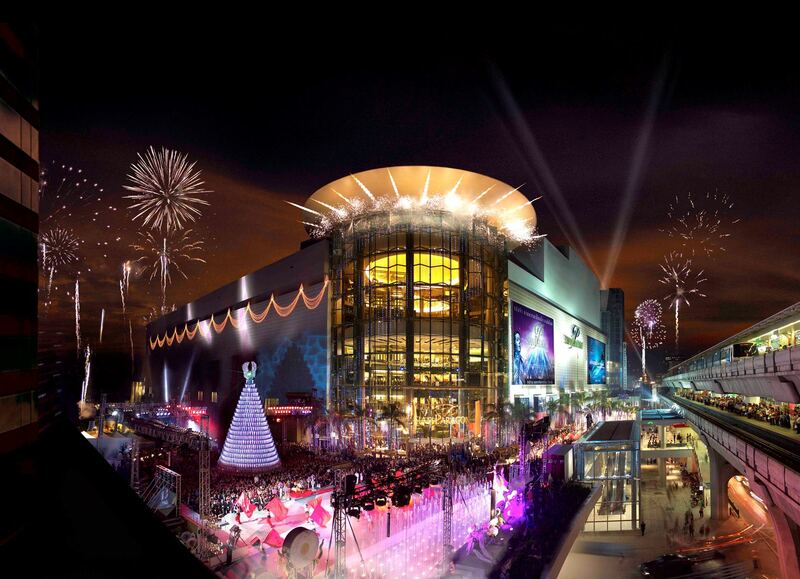 MBK Center , an enormous marble mall since 1985 , the 8-story high and 330 meters long is one of the biggest mall in Asia . 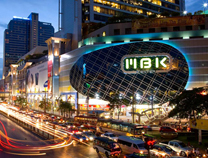 Due to the size and lately renovation to millennium outlook , MBK Center has been accepted to be one of the most recognizable attraction building in Bangkok . 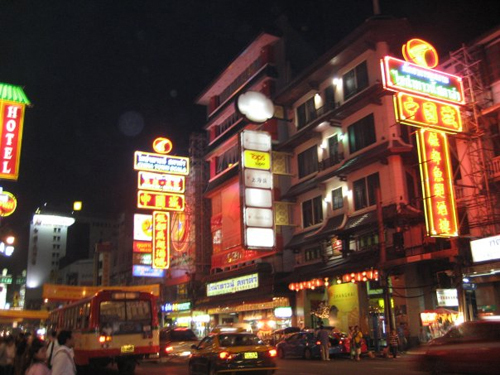 As this mall is situated at the beginning of the shopping centers that line along Sukumvit Road , Bangkok 's main shopping street, shoppers usually start their journey from here and continue to other shopping places nearby. The one and only world class shopping centerin Thailand . The 500,000 sqm complex houses over 350 flagship stores of the world's luxurious brands of fashion, accessories, home furnishings and sports, also the biggest watch in Asia featuring 50 world's renowned brands. Shop for traditional gifts and souvenirs at the 5,000 sqm. Paragon Passage, showcasing refined handicrafts, antiques and handmade products. Visit Paragon Department Store, the largest in Thailand offering top brands of personal, and lifestyle items. Wine and dine in over 100 Thai and international divine dining experience in unique ambience. See over 200,000 species of marine lives at the biggest aquarium in Asia and enjoy the latest blockbusters at larger than life 16-screen Paragon Cineplex.